My name is Fernando and I've been watching your videos for awhile now, and they've been helpful. I could see and hear that your a lover of soulful music and so I am. I'm new to beat making and I'm just starting out. I also have an Akai mpd32 and the machine is amazing. I can assign the samples to the pad, the only thing that is giving me trouble is laying drums over it. I forget to mention that I'm using Reason 4.0. I have the creativity, the only thing that is holding me back is the technical side. If you have time can you give me a few pointers on what you do, that would be helpful thanks. I also wanted to point out in one of your videos I thought I seen a Wayne Grudem 'Systematic Theology' book. If it is, its a good read. I'm also a Born Again Christian, so other then music we also share something, and its the Love for our Lord and Savior Jesus Christ. Do you also listen to Christian hip-hop? (Shai linne, Flame, Steven the Levite, Timothy Brindle, etc) I hope to hear from you soon. Layering is a beat making skill that you must master as a music producer. Hip-Hop music producers, especially, have to master different ways of layering drums and layering samples in order to get the right motion and feel for the music style they want to create. I want to give you the layering tips and techniques I use when I make beats in Propellerhead Reason music making software. Don't worry, you can use my beat making tips and techniques in any DAW. Most DAWs have a sequencer that shows the different tracks used in a beat, song or piece of music. Each track can be thought of as a "layer" containing some instrument or sound. So, technically, you are already using layering when you create even the simplest beat patten. When layering drum sounds or layering samples, you are basically combining sounds from two or more track layers to get something different from simply playin either of the tracks individually. The results of layering vary, but no matter what music genre you are making, you will probably use this technique. 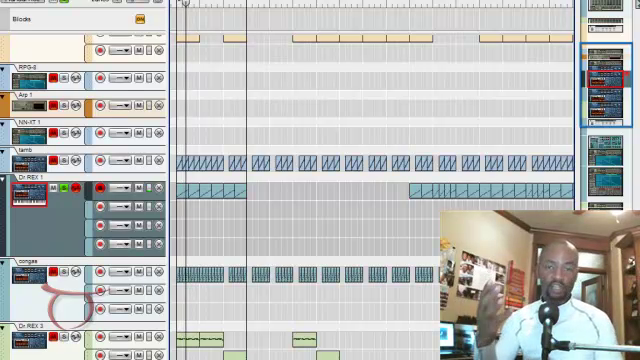 In the video below, I start by playing a looped sample in one track of the Propellerhead Reason sequencer. Then, I play a drum pattern in another track, that plays at the same time as the first track containing the looped sample. The looped sample has a certain rhythm/feel to it and the drum pattern has a different rhythm.feel. Layering the two tracks results in a completely different feel and movement for the beat. This video shows a basic beat using a sample and programmed drums. So, I am showing a basic example of drum layering and sample layering at the same time. In this next video, I take the basic layering concept and use it to create the moody instrumental music remix "CLOSER" - showing my process of "wrappin the samples" in more instrumentation to create a full, piano featured song. First, I get inspiration to make beats and make Moody Instrumental Music from many places. One time, I was inspired to make another one of my Moody Instrumental Music creations, "Closer", after listening to "Love is a Battlefield" by Pat Benatar. "Closer" is one of my sample flip beats in which I rearrange samples from existing music into something new and unique to me. I created a beat tutorial video series to show a little about how I take samples from an existing song and then "flip" (rearrange) the samples into different patterns before "wrapping" the sample flips patterns with various instrumentation I perform. In two parts of the six-part video series, I explain my process of layering drums and layering samples when I make sample flip beats and moody instrumental music. I "layer" all parts of my drums. Looking at my sequencer in Propellerheads Reason 4.0.1, you will see multiple ReDrum devices, each containing multiple drum tracks. I layer my snares at least three (3) layers thick with different snare sounds. For each layer, I play the snare part without quantizing, so the sounds are not heard as one sound. The timing is off just enough so you can hear each of the sounds that make up the layered snare sound. I do the same thing for all the other drum parts, except for the kick drum. I still layer the kick, but I play the kick pattern once and copy and paste it to the other ReDrum devices for layering. This way, the different kicks hit together with the same timimg, making one sound. If you google this subject of layering drums while making beats, you may find a lot of writing about "feel" and getting the right feel to your drums. This is another way of saying "humanize" your drums, or make your drums sound more like they have been played by human hands rather than programmed in a computer. Using Propellerhead Reason or any other software like FLStudio, Garage Band or Ableton Live, you have to use a computer to make music. You are just trying to get the music to sound more human - or "less perfect" even. Listen to my Moody instruMental Music and you will notice that my earier tracks are very "stiff" or "straight" or "computer" sounding. My later tracks still sound "computer-ish" to me, but in relation to my earlier tracks, they are alot more dynamic with a lot more movement, bounce, swing or "groove" to them. You can try to apply groove templates to make your drums sound more human, but all that really does is make the drums sound "computer groovy" - too straight or too perfect a groove. As a professional drummer, I accept that there is going to be a diference when it comes to comparing my timing (when I play) with that of a click track. I'm human, so when I'm laying drums in a studio while playing a drum kit, I'm going to be off a little when compared to a click track or metronome. When I recorded the drums in a studio for the songs on the Faithwalk album for my Gospel Jazz Band, I was able to use a drum loop as a click track/metronome for a couple of songs. While my playing sounded "spot on" or perfectly matched to the drum loop, I knew that I was a little off and had to continuously adjust so that I didn't play too slow or too fast. Live (human) music from a band has variations in timing even though the overall tempo may appear to be static. The continuous, tiny "movement" of the drums can give a song a degree of motion that has a positive impact - a nice groove - making the song better. Too much drum movement arond the desired tempo can have the opposite result and the drums and song just end up sounding sloppy. A key to all of this is practice. You have to practice laying the durms without quantizing to get "your" feel and figure out your groove. Remember to practice playing the other instruments without quantizing, too. Another key is knowing which tracks to groove and which to quantize. This also comes with practice. When laying drums, I sometimes quantize a single hi-hat that plays low in the overall mix. That quantized hi-hat serves as my metronome and everything else is played around it. I develop the groove of all the other instruments, including the pther parts of the drum kit, around that hi-hat. HTH! Yes! I am a Christ disciple (born-again Christian) and you did see Wayne Grudem's "Systematic Theology" text in my videos. I teach Theology and Christian Doctrine at Oakland Baptist Church, one of the local churches here in Alexandria, Virginia. I don't listen to a lot of music because I'm too busy making my own! But when I do listen, I listen to mostly Cross Movement artists - Phanatik and Ambassador, along with Da' TRUTH. I'll put together a video showing you how I do my drums. I'll try and get that up for you by this Saturday. But don't be mad if it takes longer. I'm in seminary, so I may have to get some homework done first. Be sure to check out my blog for more info about my faith walk and check out the other beat-making video tutorials I have here at TaurusBeats.com to help you to Make Drum Tracks While Making Beats.